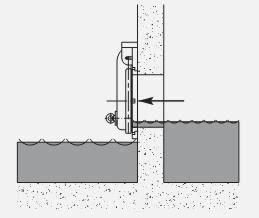 Read More: "Introduction To HDPE Flap Valves"
Flap-Valve wall mount design, fasten directly to the wall at the outfall. A flap valve when placed in front of a culvert pipe, is a one-way seal. When there is head pressure from behind (inlet pressure) the flap door opens and discharges the water. When the water head (front) pressure increases the flap door closes and presses against the door seal. Flap Valves WA.PTK-G wall mount valves come with chemical bolts for anchoring the unit to the wall. A wall gaskets placed between the back flange collar and the wall provides leak protection. The unit sets vertically flush with the wall. 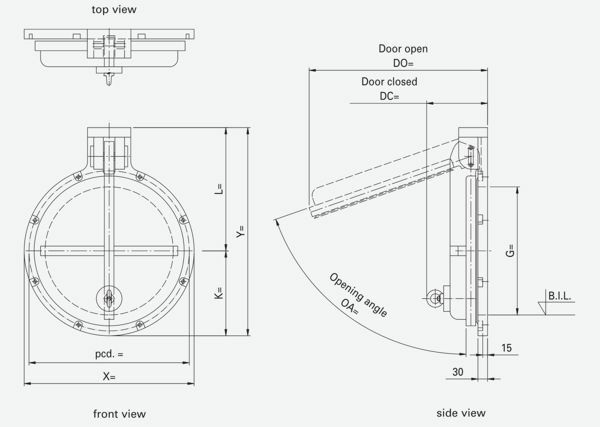 The flap door operates with just a few mm of head differential pressure. Water flows through the valve to allow water build up to escape but prevents rising water levels from the door side to flow back up the pipe. Non-return flap valve suitable for emergency application/ flood protection. Head pressures: one meter water head on a permanent bases. In Flood water five meter water head for 72 hours measured from bottom of opening. Higher pressure doors are available. Flap Valves wall mount models: Fit all American and International pipe sizes. The flap door opens with just a few millimeters of differential water pressure. Flap valves HDPE models are easy to handle and install. HDPE material valves are highly resistant to aggressive fluids. 316L stainless steel is used for all metallic parts, E.g. hinges, hooks etc. Flap valves WA. PTK-G wall mount models mount flush with the wall. They are suitable for below and above the waterline. They prevent back flow in times of emergency and allow outflow when the upstream pressure exceeds the pressure on the door. Just a few mm of water will allow flow. The valve is not hindered by its own weight and will open with very little differential pressure. Differential opening pressure are less than 10 mm water column. Good chemical resistance against acids salts and alkalis, many solvents, oils, etc. Contact Westatlantic Tech Corp..,, for sizing assistance, HDPE flap valves fit all American and International pipe sizing. Flap Valves, Hope Flap valves, check valves, flood control, round and rectangular models: USA, US: Texas, TX, Houston, New York, NY, Illinois, IL, North Dakota, ND, Iowa, IA, Ohio, OH, Michigan, New York, NY, Kentucky, KC, California, CA, Colorado, Denver, Louisiana, LA, Florida, FL., Pennsylvania, PA. Canada: Alberta, AB; Edmonton, Fort McMurray Calgary, Fort Nelson, Grande Prairie, Lioydminster, Red Deer, Lethbridge. British Colombia, BC; Kelowna, Vancouver, Prince Rupert, Kitimat, Terrace, Fort St John. Ontario, ON; Toronto, London, Ottawa, Hamilton, London, Mississauga. Saskatchewan, SK; Regina, Saskatoon, Prince Albert, Estevan, Swift Current. Manitoba MB; Winnipeg, Thompson. Quebec, QC; Montreal, Quebec City, Trois-Rieviers, Val-d'or, Chebougamau, Sherbrook. New Brunswick, NB, Nova Scotia, Newfoundland Labrador, NL. Including Saint John, Moncton, Halifax, Sydney, St John's.